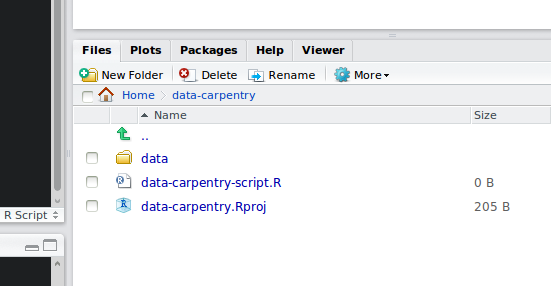 RStudio provides a helpful set of tools to do this through its “Projects” interface, which not only creates a working directory for you but also remembers its location (allowing you to quickly navigate to it) and optonally preserves custom settings and open files to make it easier to resume work after a break. Below, we will go through the steps for creating an RProject for this tutorial. Using a consistent folder structure across your projects will help keep things organized, and will also make it easy find/file things in the future. This can be especially helpful when you have multiple projects. In general, you may create directories (folders) for scripts, data, and documents. data/ Use this folder to store your raw data and intermediate datasets you may create for the need of a particular analysis. For the sake of transparency and provenance, you should always keep a copy of your raw data accessible and do as much of your data cleanup and preprocessing programmatically (i.e. with scripts, rather than manually) as possible. Separating raw data from processed data is also a good idea. For example, you could have files data/raw/tree_survey.plot1.txt and ...plot2.txt kept separate from a data/processed/tree.survey.csv file generated by the scripts/01.preprocess.tree_survey.R script. You may want additional directories or subdirectories depending on your project needs, but these should form the backbone of your working directory. For this workshop, you only need a data/ folder. 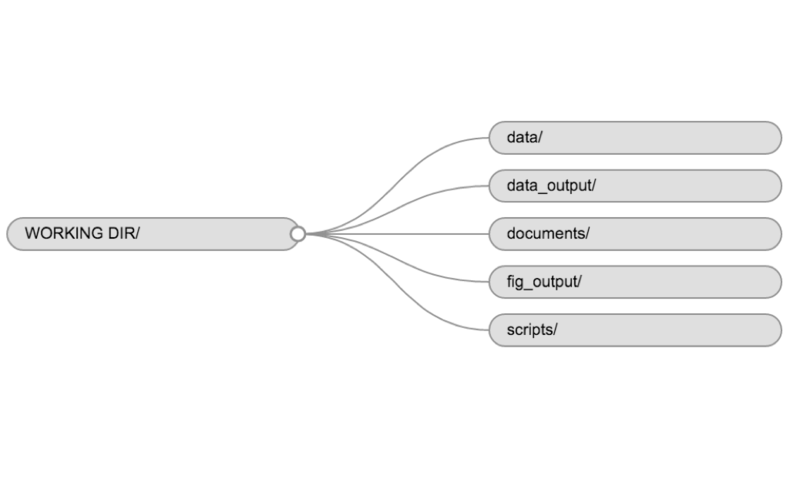 RStudio also shows thee objects in the Environment panel. What happens here is that we take the original vector animals, and we are adding another item first to the end of the other ones, and then another item at the beginning. We can do this over and over again to grow a vector, or assemble a dataset. As we program, this may be useful to add results that we are collecting or calculating. Vectors are one of the many data structures that R uses. Other important ones are lists (list), matrices (matrix), data frames (data.frame) and factors (factor). What happens to vectors with mixed types? Vectors must all be of one type, and so R converts them. R indexes start at 1. Programming languages like Fortran, MATLAB, and R start counting at 1, because that’s what human beings typically do. Languages in the C family (including C++, Java, Perl, and Python) count from 0 because that’s simpler for computers to do. Subset to get the 2nd and 3rd values. Subset animals with weights < 200. If your data include missing values, you may want to become familiar with the functions is.na() and na.omit(). examples. Why does the following give an error? Why does the error message say the data are not numeric?